'The Hangman' #3 opens with a scene that could have come straight from 'Damien.' It's a creepy and strangely satisfying exchange between a bully and an odd little kid. Although we later learn he's no ordinary kid. 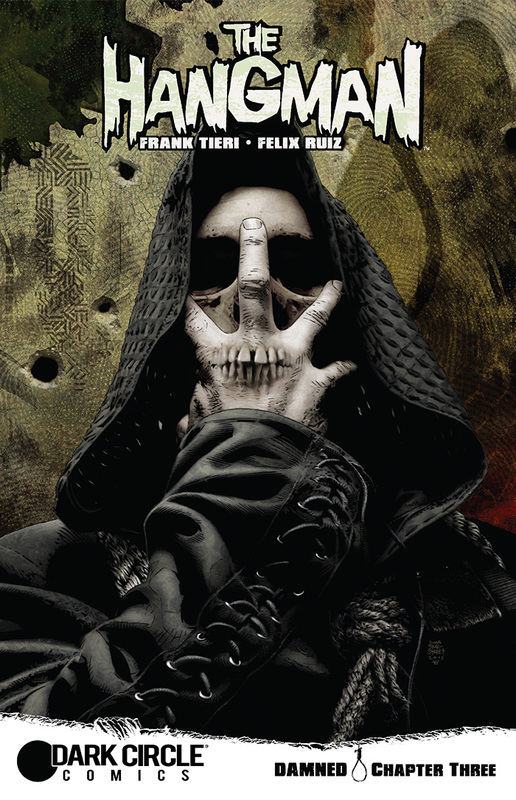 This third chapter by Frank Tieri and Felix Ruiz keeps developing the story of a hitman sent to hell only to return to earth as a vengeful harbinger of death. Dark and twisted but devilishly entertaining, 'The Hangman' keeps evolving into the best title from Dark Circle Comics. When Archie Comics reestablished the Dark Circle imprint it was important to define itself quickly and with quality stories. The Black Hood started strong behind Duane Swierczynski and Michael Gaydos but has tapered off a little in quality lately. The Shield had a lot of promise but delays and an underwhelming first issue hasn't helped make it the hit I envisioned it would be when its release was announced. The title I expected the least from has surpassed my expectations. 'The Hangman' has delivered a completely different chapter in each of the three issues so far, introducing new characters and slowly unfolding more of the story. The first issue wasn't even about the Hangman, it was a fast-paced set-up to bring the hitman Minetta to Hell in the second issue. There we get the details of what it means to be the Devil's hangman. In this issue, Minetta is back on earth as the newest Hangman and learns he's got a scribe, just as others before him, who'll document is every move. The story is interwoven with cuts to the demon Azmodeus as he is made aware of the new Hangman. Even the bringer of death has rivals. Ruiz's artwork is gritty and sketchy with hints of strategically placed colors. It's otherwise dark with shadows and effective in keeping an ominous cloud of doom in the air. You can call it horror-noir if you'd like but the pacing is quick with a fluid layout. The cliffhanger is especially brutal with the use of deep red and a range of angles. There's no doubt that Archie wanted to make Dark Circle its more adult and mature-themed line of comics. Thankfully, with the help of 'The Hangman,' Dark Circle has become Archie's version of DC's Vertigo Comics with a slick, edgy story that draws you in every month. It's a little twisted and dark but also fresh and compelling. It's become worth adding to your pull list so you don't miss it.